Congratulations on the birth or pending birth of your child or godchild! Our team at Saint Brigid Parish welcomes your inquiry about the gateway sacrament of baptism. 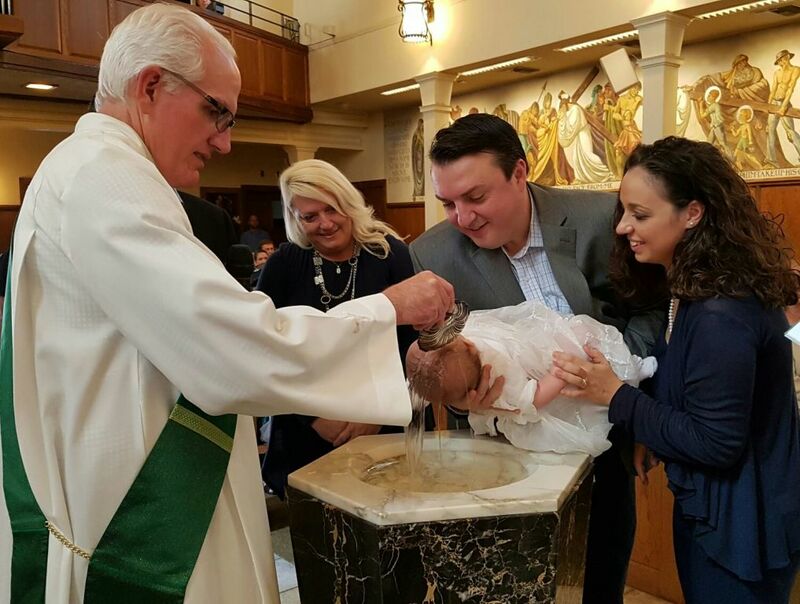 By seeking to have a child baptized, parents express their intent and accept the responsibility to educate their child in the practice of the Catholic faith, as do the godparents. This time in your life brings a renewed invitation for parents and godparents to Encounter, Love, and Serve ~ Jesus, One Another, and the World. Participation in our Connection To Christ (C2C) small groups, which meet seasonally, is highly encouraged for parents and godparents. Connection to Christ Small groups are a great way to meet new people, ask questions, and grow in faith. To learn more or join a group click here. In our sacrament orientation, we'll share and discuss the theology of the Sacrament of Baptism, and reflect on the deeper meaning of our Christian identity. Our orientation dinners for parents and godparents are scheduled every other month, from 6 - 8 pm. To attend an Infant Baptism Orientation Dinner, complete the online registration form or contact Lee Hulburt. The Rite of Baptism for Children strongly recommends that Baptisms take place on Sunday, the day of the Resurrection, at a communal celebration (e.g. Sunday Mass) because it enables the entire community to be present and brings out clearly the relationship between Baptism and the Eucharist. Click here to see some families who recently had a child baptized at our parish. Is your child unbaptized and 7 years and older? Please contact our religious education director, Gayle Heyman, to discuss your child's sacrament preparation journey. RCIA is the process for an unbaptized adult to explore the Catholic faith through an "apprenticeship" in the way of Christian discipleship within this community of believers. For more information about this process, including information for baptized Christians or baptized Catholics desiring preparation for the sacraments of initiation, please consult the RCIA page or contact Lee Hulburt in the parish office. From time to time you may need to produce a new baptism certificate, e.g. for Catholic school enrollment and to receive additional sacraments of initiation. Certificates obtained for marriage must be dated no more than six months in advance of your wedding date, so please time your request appropriately. 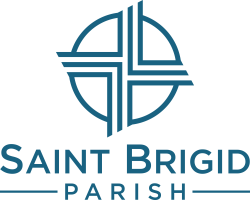 If you were baptized here at Saint Brigid and need a new certificate, please contact the parish secretary, Becky Ricard, to request a copy: 858-483-3030 ext. 100.